Start off as a lone survivor in the crumbled remains of what used to be your house as your neighbors are in hiding, the streets and buildings turned to rubble and a horde of zombies trolls right outside what remains of your fence. 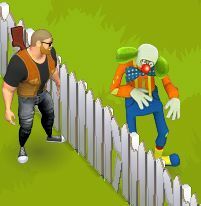 Zombie Lane is a zombie neighborhood style social game by Digital Chocolate. Take back control of your neighborhood from Zombies! Equip a weapon of your choice and fight off the endless waves of the undead! Smack them with a shovel or take them down quickly with a shotgun. In a post zombie apocalyptic world where Zombies have overrun the planet and your neighborhood is in ruin, you must fend off the hordes of undead walkers and rebuild your community to the way it was. Utilizing your friends as your neighbors, taking advantage of helping each other out plays a big role in moving forward.